Help a few songbirds remain hydrated and clean by placing these Gardman Blue Glazed Hanging Bird Baths in your garden. This set of 2 stoneware baths holds plenty of water for a few birds, while the beige and blue tones add a vivid hint. A thick rim on each bath offers perching room for a few birds, while the 2" depth is great for your smaller feathered friends. Raised bird figures on the exterior of each unit further the theme, and a cobalt blue, glazed interior enhances the water. Use the included, 17.25" long chain hangers to showcase these baths from a bracket or branch, or place them on the ground for a different look. Keep water available to several songbirds in these Blue Glazed Hanging Bird Baths. 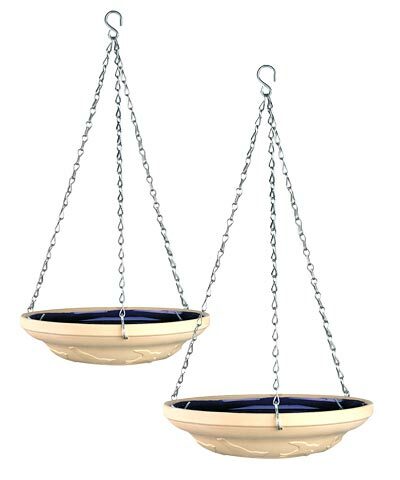 Note: This case pack includes 2 of the Gardman Glazed Hanging Bird Baths, Blue.